Today, I'm happy to announce that the Cabin pattern is back! I would say that it is 'New and Improved' but that saying always seemed a little contradictory to me. I suppose in this case, it's somewhat accurate. I released Cabin in 2014. It was my first pattern and, admittedly, I was still figuring this whole pattern thing out. Not only has my vision for the pattern company evolved, but so have my design, drafting, grading, and illustration skills! 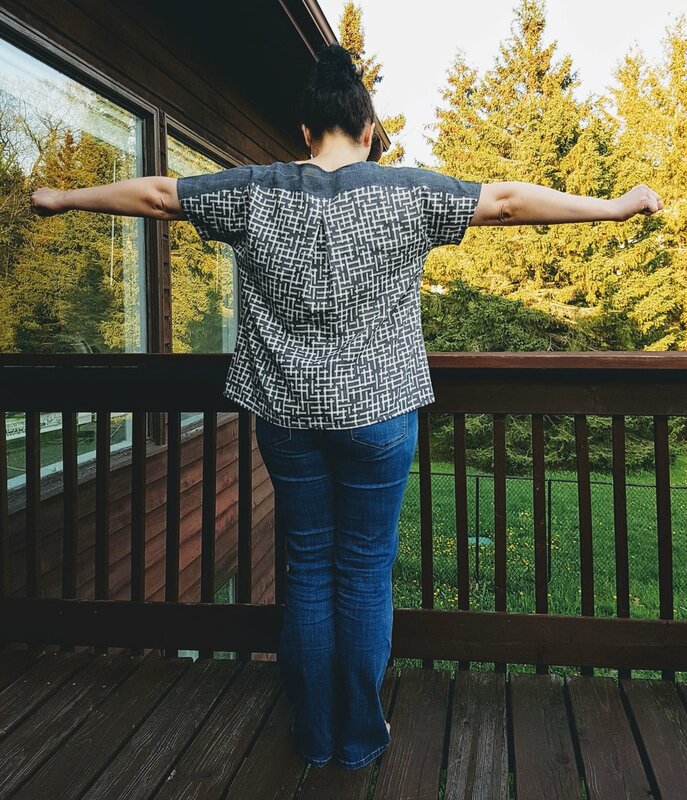 I've always loved Cabin and it remains one of my most popular patterns to this day. So when the time came to have Cabin reprinted, I decided it was time to give her a bit of a reno. I've included some photos of my lovely pattern testers so you can see the new Cabin pattern in action. I'm going to be real here and say that the drafting on the original Cabin was far from perfect. At the time, I didn't have a very wide pool of testers and missed a few key fit issues that might have been resolved through testing. The good news is, with a very relaxed cut, the style proved totally wearable and many people loved it just as it was. However, from pretty early on I definitely realized a few improvements I could make to the fit and decided that when I reprinted the patterns, I'd make these adjustments. Though I've trained myself to be more relaxed in other parts of my life (like implementing the 3 foot rule), when it comes to my products, I'm a textbook over-thinker and very detail obsessed. So, of course, a few updates turned into a complete overhaul. When I originally created Cabin, I included instructions for an FBA. While this proved helpful for bigger busted sewists, the traditional FBA messed with the overall silhouette a bit. Following in suit with Moderne, I decided to include two bust size options in the new Cabin. 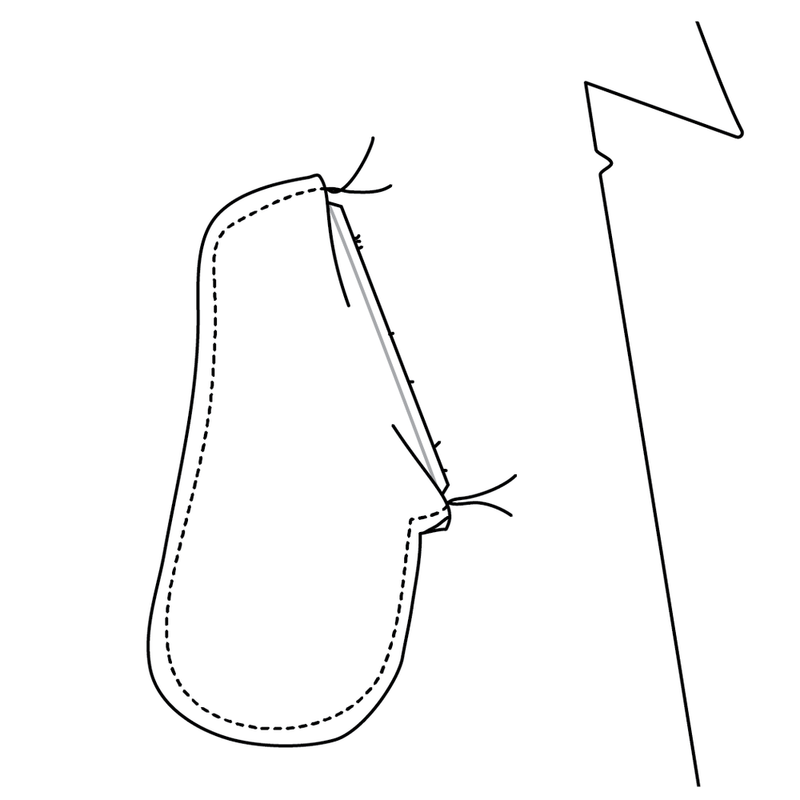 The pattern piece for Bust Size 2 includes a slightly larger dart but keeps the overall proportions of the rest of the garment the same. The original Cabin sleeves were quite snug. I've always had pretty shrimpy arms (and my dress form has none!) so this was an easy oversight with a limited tester pool. Cabin 2.0 has much roomier sleeves. The yoke is also wider so you see more of it, which is great when using a contrast print. The pattern was originally envisioned as a sort of shift or short dress, most likely to be worn over leggings. However, I found that for many people, the length was neither here nor there: a touch too long for a tunic and a bit too short for a dress. I added a dress length option, and shortened the original length slightly to create a tunic length. While I love the swingyness of the boxy back pleat shift, I found that some folks were interested in the idea of a more fitted Cabin and it peaked my interest as well. So as an experiment, I played around with switching the back pleat to darts and loved the fit, so I thought I'd include it in the new Cabin for more versatility! Anna ( @freshslicedpeaches ) in Cabin V2 w/ back darts. Extended sizing! Starting with Geodesic, I extended my size range to go up to a 50" bust. The new Cabin includes this extended sizing. Product design is involved. There are all sorts of elements you can only prototype so far before you produce 1000+ copies. It took me a while to refine the envelope design for my patterns and I think I finally nailed it when Geodesic was printed. As each pattern gets reprinted, It uses this new cover design and includes large instruction sheets as well as patterns printed on tissue paper rather than copy paper. With Geodesic, I also decided to retire the artist cover series. While I loved the concept in theory, the covers weren't always able to clearly convey the garment. I decided to switch over to illustrating the covers myself and trying to show the clear lines of the garment on a variety of body types while still retaining some fun, hand drawn character. In case you're curious, my cover designs are based on vintage photographs. I love fashion history and find candid images of women in clothing through history to be absolutely wonderful. I keep an eye out for vintage photographs where the subjects look like somebody I'd want to be friends with (and their clothing, if you squint, perhaps looks like the garment in the pattern. I take some creative liberties 😉). Also included in Cabin 2.0 are updated instructions with clearer illustrations and descriptions of tricky techniques. I also decided to free up some real estate in the instructions for a section about making your own bias tape by removing the seam finish instructions. Instead, I'll be creating a thorough seam finish resource on my website in the upcoming weeks. The original Cabin instructions were hand-drawn on paper, scanned, cleaned up, etc. Starting with A-frame, I switched to creating much clearer and more consistent illustration digitally. If you've already bought Cabin (especially the paper version) I want to share the bounty of her updated-ness with you for a little while without you having the buy the pattern again. For the first week (7/19/- 7/26) I'll be offering a free PDF update to anybody who has purchased a PDF or paper copy of Cabin. To get your update, visit this page and follow the instructions!